We have Natural Purplish Pink 1.65 Carat Intense Emerald Cut Diamond! This extremely rare Natural Purplish Pink 1.65 Carat Intense, VS Clarity, GIA Certified, Emerald Cut Diamond is available today at NYC Wholesale Diamonds. This magnificently rare find is available today at $285,000 per carat to our private clients here at our NYC Wholesale Diamonds location in the New York Diamond District location. 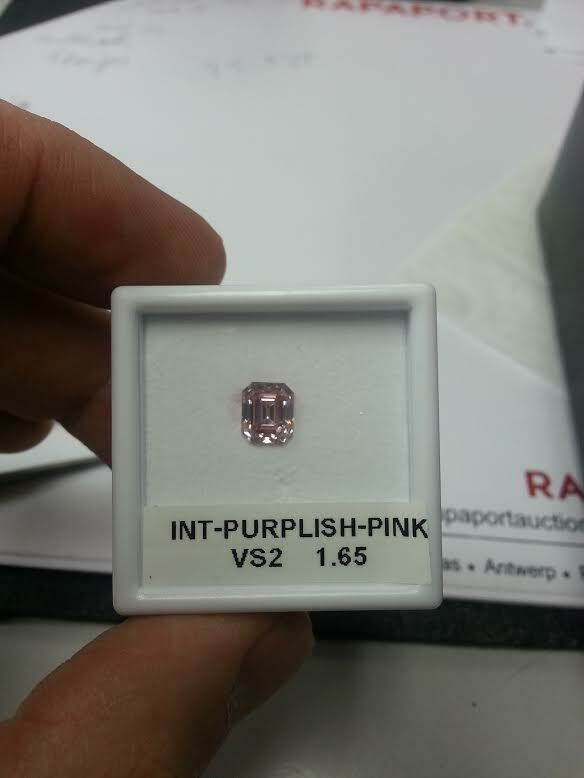 The soon to be auctioned Natural Intense Purplish Pink Diamond will be priced at $350,000 per carat at auction in June. Pricing represents more than a $100,000 discount to auction. Sotheby’s announced today that it sold a record $141.5 million in jewelry at its spring auction, including the highest amount ever paid for a yellow diamond — $16.3 million for the 100.09-carat “Graff Vivid Yellow” diamond ring. Our Purplish Pink, VS Clarity, GIA graded Intense, Emerald Cut Diamond is a unique rare bend of color, clarity and shape. The Associated Press reported intense bidding from around the globe Tuesday night. Contact Keith J. Saxe, NYC Wholesale Diamonds President for more information including copies of GIA certification and an appointment to view this magnificent rare natural color diamond.